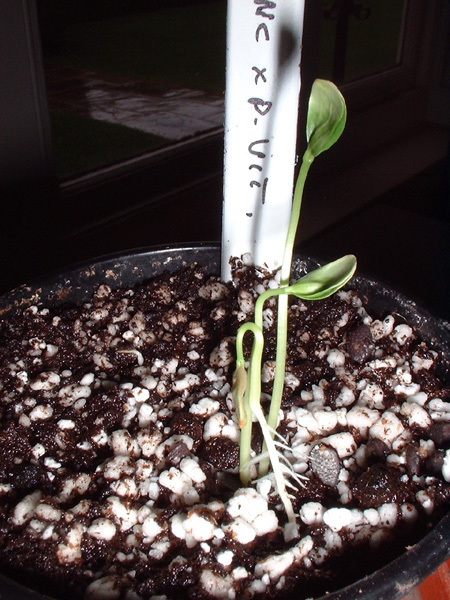 The Passiflora incarnata seedlings above are a few days old. Having been stored in the fridge for a few months they came up 4 days after sowing. Amazing, as like many Passionflowers, it can be very difficult to grow from seed. Passiflora seed sowing & germination is a complex matter about which little is known for sure. There are many ways to skin this particular cat. For the beginner who does not want to wade through pages of text see below for the basics re seed germination. Read more about seed germination inhibitors, promoters, pre-soaks & seed storage. Note that new hybrids must be grown from seed of the parental cross, which will be more variable than species seed, possibly with the plant taking more characteristics of the female flower & the male foliage. The best seedlings of hybrids can be named & then cuttings taken to perpetuate them. If you grow a plant from hybrid seed it may flower within a few months. Species seed may take up to 5-6 years although most will do it in two. Exceptions include P. incarnata, P. foetida & P. tarminiana which may also flower within months. Also some plants grown from seed may never flower. Existing hybrids will only grow true from cuttings. It may be worth filing the seed coat down a bit with a nail file or fine sandpaper, especially along the join, as old seed may have less stored energy in it to help the embryo to burst out of the seed coat. This may mimic seed coat erosion from passing through an animal. I don’t do this on the basis that the seed coat is porous once surface tension is broken. Presoak dry seed for 48-72 hours in a small glass of water in a warm location e.g. a sunny window cill. As an alternative you can use orange juice, apple juice or fresh Passionfruit juice (my choice) from commercial fruit. As it ferments it may remove germination inhibitors. Any viable seed should sink to the bottom of the glass. Throw out any seed that are still floating unless they are rare and precious in which case sow them too. Fresh wet seed will generally give far better germination rates and I just sow it straight from the fruit. That can be either complete with arils, the juicy sacs, or if you wish to remove them first, I find rubbing the seed while wrapped in fine microfibre cloth works well. I am indebted to Carlos Magdalena for his suggestions. He uses a mix of 4cm deep coir and Perlite with a compost mix underneath to give the seed nutrition once it hatches out. Water well, then place the seed on the top and cover with a further half a cm or 1cm more coir & Perlite and water again. 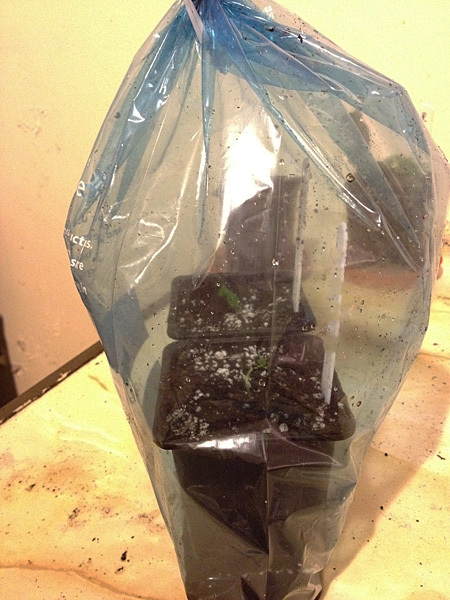 Put the pot in a sealed plastic bag somewhere warm and sunny or in a propagator. 100% humidity is essential. If you have a Propagator you have two optimal choices. Either set a constant temperature, I use 80F/27°C, or nighttime 68F/20°C and daytime 86F/30°C. Even higher temperatures may help. Compost heaps can reach 140F/60C! Be patient.. wait & hope.. it may take a few days or even many months! Even if nothing comes up you may have done nothing wrong. If all else fails change their conditions, e.g. let them dry out totally, or put in the fridge c/w the potting mix they are in etc. If something does come up gently ease the seedling out of the bag and pot up in a 50/50 mix of compost and Perlite, one per pot as above. Keep it in a plastic bag to start with & gradually roll it down to expose it to the air over a few days. Then place somewhere sunny with good air circulation to begin hardening off. See below. A good principle is to realise that the seed is as desperate as you for it to succeed…getting angry because they fail to germinate or the seedlings topple over will not help! Always work on the principle of changing the variables as quickly as possible. If in doubt push the seedlings & expose them to heat, light & fresh air as soon as possible. Over summer particularly, if a seedling droops DON’T PANIC!…but reseal the bag over it & move it out of direct sunlight until it recovers. Note that some seedlings such as P. membranacea need to have very high humidity when tiny or the leaves will crumple and so are best not rushed. 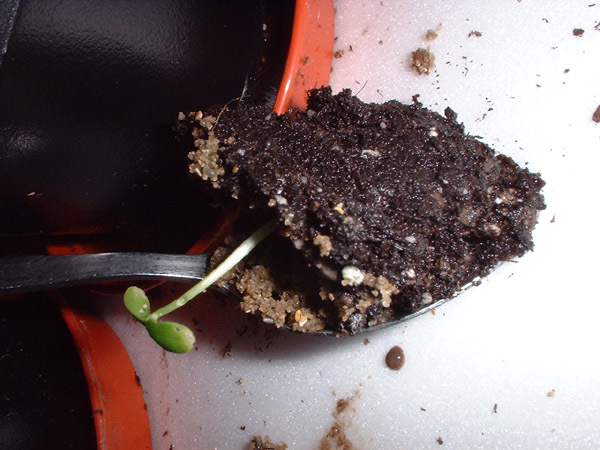 This may sound a little ‘New Age’ but at this stage or even earlier it is a good idea to stroke your seedling 10 times a day – fingers are ok but a clean wooden dowel e.g. a chopstick would be ideal. Research with 2½” tomato plants shows that the mild trauma of stroking causes seedlings to secrete more ethylene & thus grow less & become more sturdy & woody – which reduces chances of damping off problems. For the more delicate seedlings just blow on them. Damping off is caused by a number of fungus infections which all seedlings are prone to. It can occur before germination – which will rot the seed, or after, which will usually result in the seedling being damaged & toppling at soil level or the roots will rot. The presence of fungus gnats is a warning sign. They will rise from the soil if the pot is tapped & are slower moving than most insects & easily caught. Damping off problems are best avoided by progressing the seedling as soon as possible using sterile soil, clean equipment, sharp sand & good air circulation. Always watering from below is also vital. Remove the propagator lid as soon as possible & always use a fan in the room to improve air circulation, which will also improve sturdiness. Never leave the soil too wet. Some seedlings are also vulnerable to mildew even with good air circulation…treat with one litre bottle of water with squirt of fairy liquid (detergent) + half teaspoon of sodium bicarbonate. To help prevent or aid recovery from fungal attack (a classic sign other than sudden death is sudden foliage wilt from the bottom upwards) include organic Neem Oil Systemic Insect Spray & surfactants which will destroy fungus without cell walls. Naiad is a proprietary surfactant available in USA, but I have had considerable success with Fairy Liquid (detergent) – adding a few drops to 500ml dilute Neem solution & a pinch of fertilizer. This should be applied to the soil rather than as a spray. Also don’t forget that shock can also occur when putting plants outside in pots or planting in the ground. Take them in & out for a few days before leaving them outside & protect them with fleece to avoid leaf drop which will put them back months. Leave a week or more to make sure they are still growing before putting into the ground with as minimal root disruption as possible. The best time to put them out is when the 5-7 day forecast is for cloudy weather. Full sun is just too much for many newly emerged Passiflora which usually start in low light conditions on the forest floor.